As someone with a heart arrhythmia (but no pacemaker! ), I did wonder if I was tempting fate with that headline but it was too good to pass up. I exchanged a few emails recently with a photographer who was exclusively contact printing. He explained his process and I was impressed with the way he had worked everything out and developed a very refined procedure for his printing. I guess you could say I just like the simplicity of the contact print. You can get ten 8 x 10 negatives exposed in a day - tray developed by inspection in pyro in the evening - hung up to dry over the sink and printfile sleeved on the lightbox the next morning. Then printing them up in a vacuum frame over a lightbulb with a metronome is easy - amidol / water bath developed. Air dried face down on screens and the trimmed and dry mounted on 13 x 15 inch alpha rag white boards. It got me thinking again about contact printing, something I do from time to time. Thinking about it, that is, not actually doing it. I've been meaning to get the big half plate Kodak Specialist II out for ages and give it a whirl but my personal inertia in this regard seems difficult to shift. 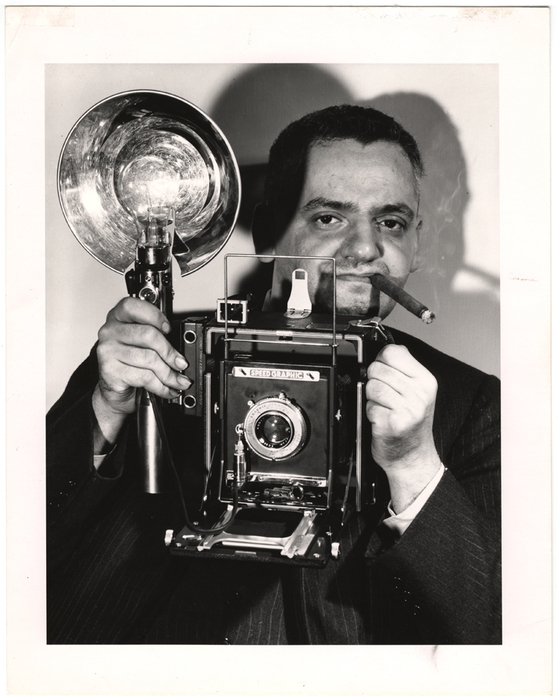 Half plate or 5x7 film (the Kodak takes both with the appropriate holders) is so expensive, x-ray film is cheaper but still a bit of an unknown quantity to me although there are plenty of photographers who use it and paper negatives seem such a carry on. I'll return to the theme of contact printing in future as I'm absolutely determined to have a bash. 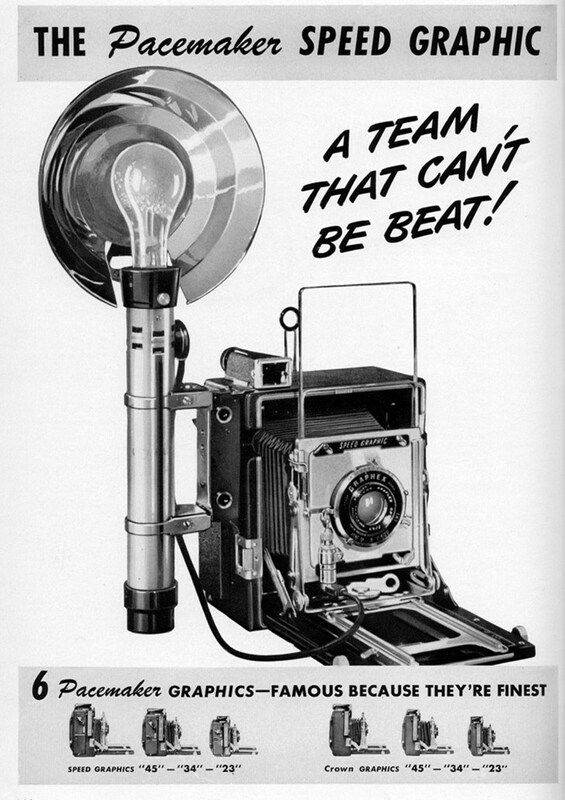 Anyway, one things leads to another and some research on the web into half plate contact printing led me eventually to a site about Pacemaker Speed Graphics, specifically about using them for hand-held photography - but with enlargements rather than contact prints in mind. I've got a lovely 1951 Speed Graphic gathering dust in a cupboard that I've used a few times but never with any great purpose in mind. It comes down to inertia again and the need to stick the 5x4 on a tripod if I want to use the ground glass. Sometimes - most of the time actually - I can't be bothered. If you're getting the idea that there's a lazy streak in me then you're not far wrong. 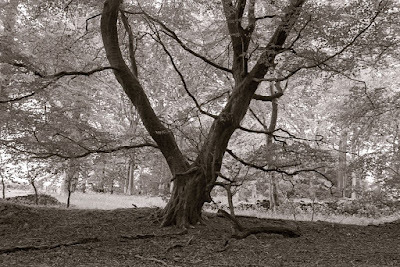 I'm happy to do the tripod thing with the Graflex if there's something I really want to photograph but I don't like going out into the countryside just on the off chance of stumbling across a picture opportunity with the Speed Graphic and its three-legged friend as my only tools. But, having made the leap to hand-held photography with the SL66E, I thought I'd look into the possibility of using the Speed Graphic in the same way. There's not a huge difference in weight or ease of use between the two cameras so it seemed an idea worth pursuing. Plus, there's always the empirical evidence that it can be done in the countless news pictures taken over the decades on 5x4 press cameras. And I've got a box of Adox CHS 100 to get through as well. I've been quite lucky with the Speed Graphic I bought five or six years ago. It came with the Kodak Ektar 127mm f4.7 lens, a favourite of the pressmen being the equivalent of around a 35mm lens on the small format. The lens is coupled to the side-mounted Kalart rangefinder. I haven't done any serious testing yet but the rangefinder seems accurate enough and they're easy to recalibrate by all accounts if anything is off. I've also got the correct mask for the Ektar lens in the tube viewfinder. What this all means, of course, is that I can load a sheet of film, focus using the rangefinder and frame the shot through the viewfinder or by means of the pull up sports finder frame. Provided I don't compose right to the edges of the frame this should work fine. The Ektar's fairly fast (for a large format lens) f4.7 maximum aperture still leaves a gloomy ground glass image to work with but this won't matter to me if I'm using the viewfinder. However, I'd forgotten just how scratched the front element is. If you look closely at the pic of my Speed Graphic you'll see that it's fitted with the 203mm Ektar. I looked out the 127mm and fitted that instead but noticed a lot of swirly marks on the glass. I know from the few sheets I've exposed with the lens that it's still sharp enough so definition isn't noticeably affected but it is a little on the flare-prone side. Never mind, though. I'll pop a lens hood on it and try to avoid flare-provoking scenes. I fancied using the 203mm Ektar with the Kodak Specialist because it's apparently a very nice lens but there are a few too many obstacles to be overcome such as the need to calibrate the rangefinder for it, make or buy a correct viewfinder mask for the different field of view and cope with the reduced depth of field from the longer focal length. My third and final large format lens is a 90mm Angulon which would be great in the tenement closes I like to photograph - provided I can find a suitable viewfinder. The Speed Graphic needs a rare adapter if you want to use a lens that wide and view through the tube viewfinder. So the 127mm Ektar seems the way to go for hand-held work where its just adequate coverage of the 5x4 negative isn't likely to be stressed by lens movements. Provided the subject is reasonably centrally placed and not stuck out on the periphery then the results should be nice and sharp. In short, if I use it like the old press guys did then it should do the job very nicely. Since I was seated in front of the TV for more than six hours on Sunday night watching The Masters golf, I thought I'd get the Speed Graphic out and give it a clean in preparation for some hand-held shooting. I had to take it apart a little to get at muck that had accumulated in difficult to reach places over the last 65 or so years. It's now looking quite nice and working very smoothly. It gave me the opportunity to see how well made the Speed Graphic is. Not in a Linhof sort of way, which is probably over-engineered, but in a just-perfect-to-get-the-job done way. Everything on the camera just works well. Yesterday, I was having a look to see which camera bag would be the right size for transporting the Speed Graphic and a few dark slides and picked up an old Camera Care Systems one that was bundled in with an auction lot I won a while back. I knew it had a Metz flash in it and some accessories but, since I never use flash, I'd never bothered to see what was there. Anyway, out came the flash apparatus and after a few minutes footering I had a slightly modernised Metz version of Weegee's old rig - you can see it in the pic at the top of the post. It's almost tempting to do some street portraits with this set-up. If only I could overcome my natural shyness and pluck up the courage to make myself the centre of some very public attention. Bruce its obvious that its the cigar in the corner of the mouth is the key here, so get your cigar and you'll be good to go. Hi Bruce - good luck - try the people approach on family and take it from there and see what happens, and good luck. 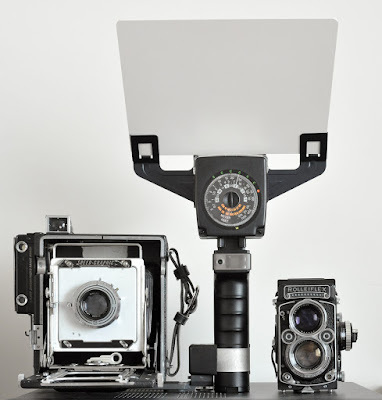 I've often thought about a Speed Graphic, but never got anywhere near getting one. If it all proves too much, you're more than welcome to have a shot of the Koni - it's a 6x7 version of a Graphic, but probably a darn sight easier to use. At last! A real camera. Well done. It seems you have to choose between three hands or three feet. You can do it and we are all waiting with three fingers crossed. I haven't contact printed for 40 years, but I still have that feeling of; there is nothing like it. Whether fantasy or reality, I would like to do it again. Just don't make the mistake I did and shoot ten sheets of film with a modern flash using the rear focal plane shutter. 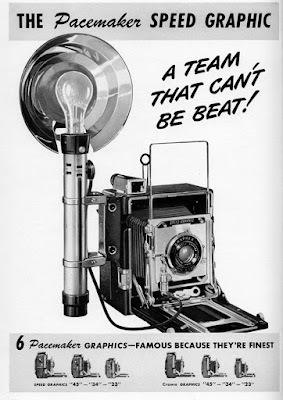 It's synched with a delay for flash bulbs. Thinking about (insert photographic dream) not actually doing it. Yeah, I can relate. So many photographic projects in mind, all boiling around, but not really setting aside time to start. I think that is my problem, schedule a time, don't wait for 'a good time' it will never come. Look on the calendar, mark your day, and when others want you to do something tell them "sorry, I have another appointment that day".